Looking to remodel your bathroom? Look no further — we came up with the top 8 ways you can remodel your bathroom. 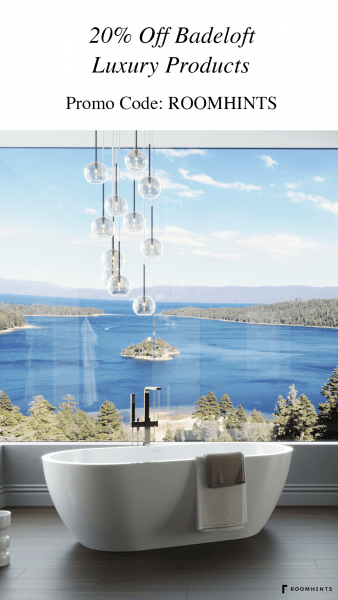 Keep reading to learn how you can create your perfect bathroom remodel and private sanctuary. Your bare walls are a great place to start when remodeling your bathroom, whether you decide to go for paint, tile, or wallpaper. 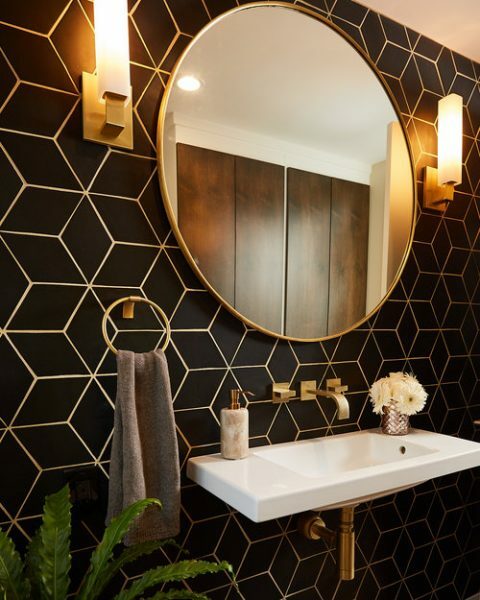 Wallpaper is a great option because there are endless design patterns so that you can create a bathroom that is not only beautiful and impactful, but truly memorable and one-of-a-kind. Wallpaper is a great way to add visual interest and introduce different colors and textures. It’s a great opportunity to take risks and go bold. 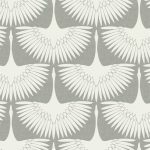 With so many options, choosing the best wallpaper for your home can be a challenging but rewarding process. Don’t listen to the haters: wallpaper is totally in. 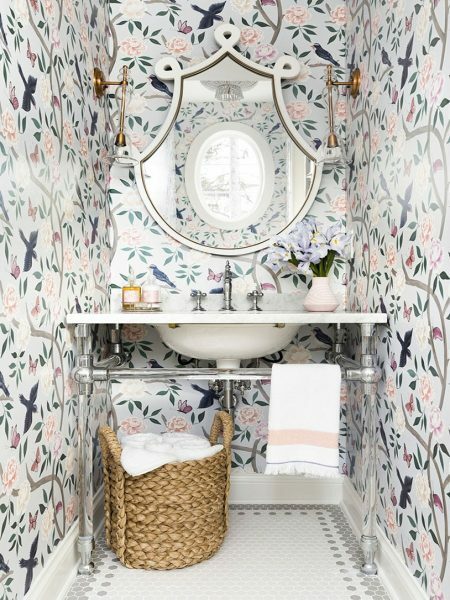 This gorgeous powder room by Bria Hammel Interiors features a floral wallpaper with hints of pink, blue, and green. To prevent clashing with the wallpaper, the clients went with a more minimal, yet ultra unique, acrylic washstand as a vanity. The smaller footprint of this vanity minimizes sight lines as to not obstruct the view of the bathroom wallpaper. 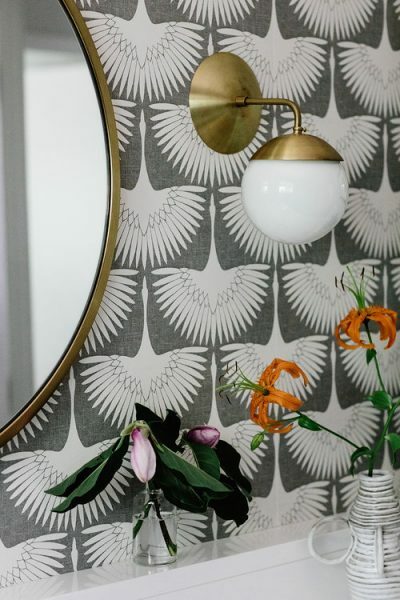 The geometric shape of the mirror pairs nicely with the shapes in the wallpaper. Lastly, clear wall sconces provide a hint of warm brass. In this classic bathroom by Crowell Interiors, a gray wallpaper with white birds adorns the walls. 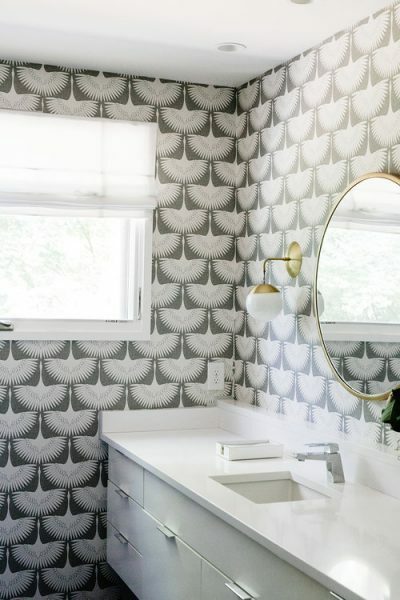 The simple design and color palette of this wallpaper is perfect for this bathroom — a simple wallpaper for a simple bathroom. 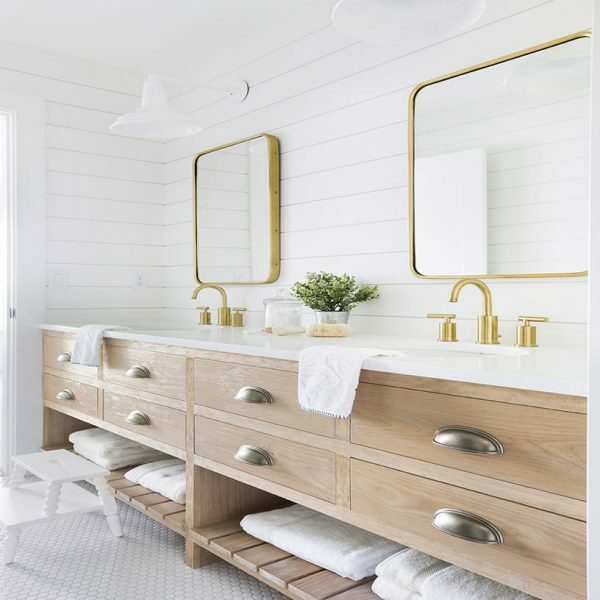 Again, we love sprinkling in hints of warm brass in a neutral space like this. 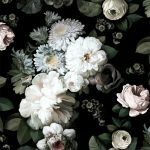 A different take on floral wallpaper, the gorgeous design of this dark floral wallpaper looks almost three-dimensional. Feminine meets edgy meets chic. Want more bathroom wallpaper inspiration? 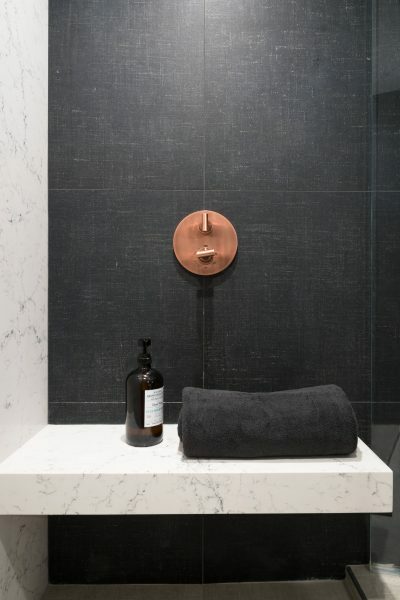 Check out our article on bathroom wallpaper here. 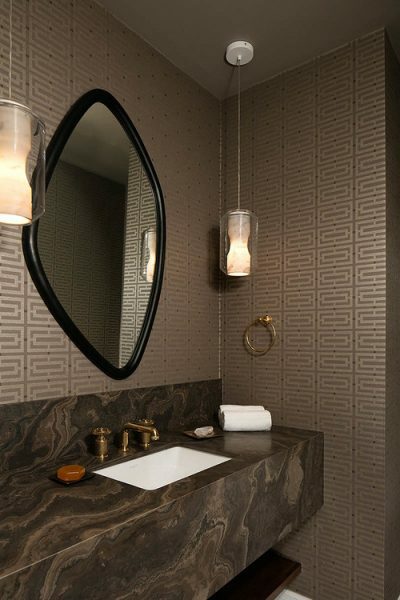 Like wallpaper, tile is a great way to make a huge impact and achieve the look that you want. Opt for a sophisticated marble for a classic, clean look, or go for a bolder tile with a unique pattern to make a statement. Much like a kitchen backsplash, a bathroom tile adds visual interest and is essential to the entire aesthetic of the room. 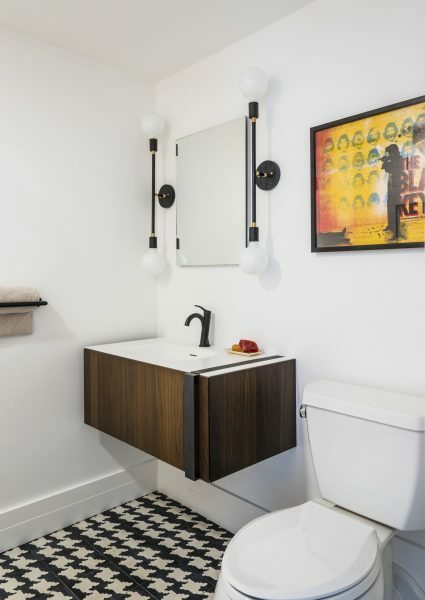 In this bathroom by Carolyn Rebuffel, a black gold-outlined rhombus tile spans the wall floor-to-ceiling. 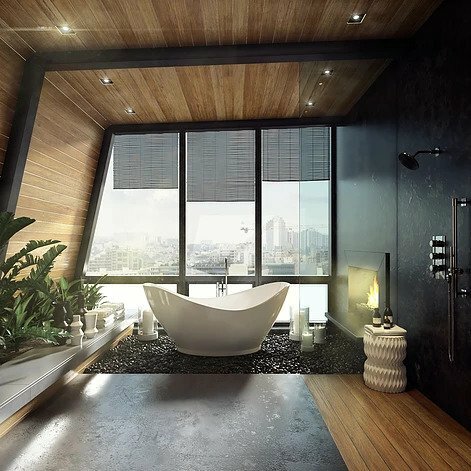 It provides the perfect backdrop for this dark, luxurious bathroom. 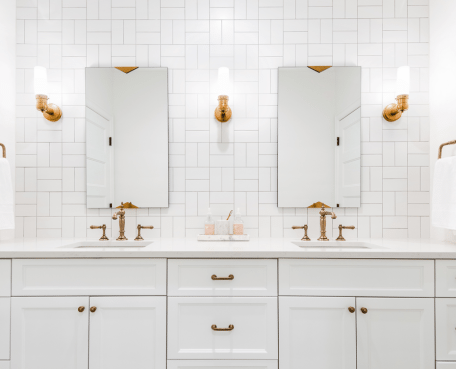 The gold in the tile is repeated in the hardware, mirror, and light sconces. 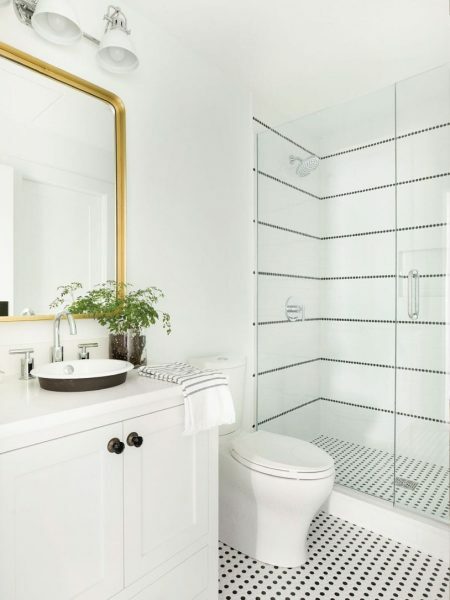 We love how RailiCA Design played with the placement, layering, and size of everything in this bathroom! 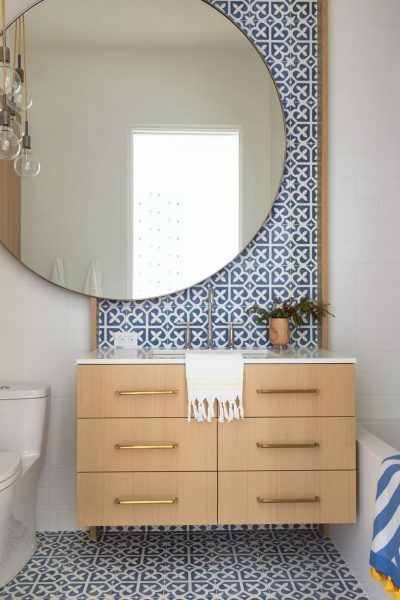 A blue Spanish tile peeks through behind the vanity and oversized mirror. The barely-noticeable floating vanity is a thoughtful touch as it lets the tile peek through just a tad. If you’re considering a tile with a busier tile, consider laying a backsplash for just a portion of your bathroom. 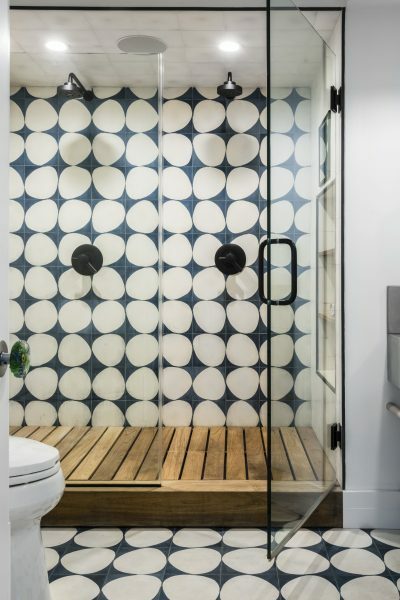 This bathroom by Aimee Anderson Design features a warm deck-like wooden floor that contrasts nicely with the blue and white tile. 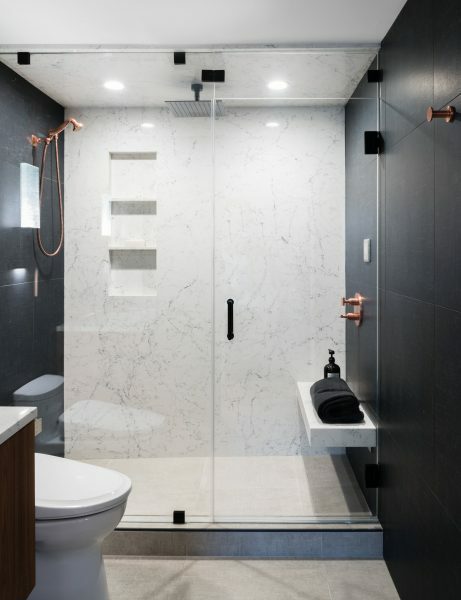 Subtle features like the matte black hardware throughout make this walk-in shower look cohesive and chic. If you have the space, consider including a free-standing tub in your bathroom remodel. 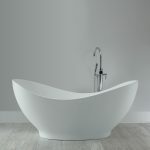 Free-standing tubs are a high-ticket item that add a sculptural element to the room, and their simple, modern, and clean look makes a huge impact. They are an ultra-luxurious status symbol that you’ll love to look at AND use. Not only do they add a feeling of luxury and sophistication, they’re a must-have when it comes to creating your spa-like sanctuary. 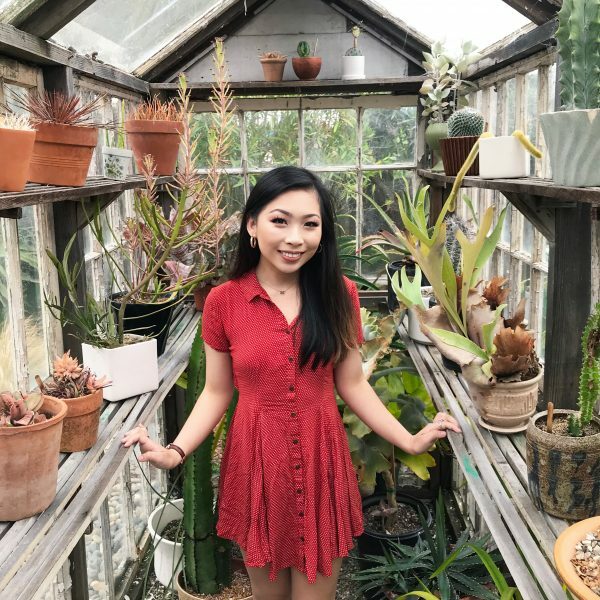 They’re pleasing to the eye and good for the soul! Design by High Q Renders. This tub from MTI Baths features sculptural, asymmetrical lines that give the tub an organic and fluid design. 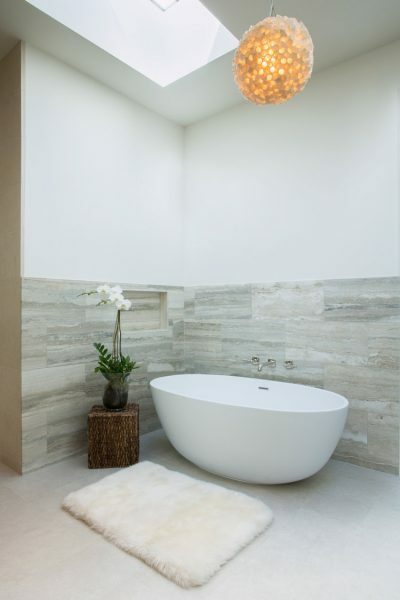 The tub is both “edgy and graceful”, and works perfectly in light, airy bathrooms as well as dark, cozy ones, as pictured. Design by bd homes interiors. 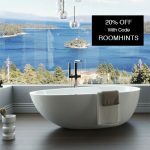 Roomhints Exclusive: get 20% off Badeloft products using code ‘ROOMHINTS’! Founded in 2009, Badeloft USA is an online retailer of luxury bathroom products. Based in Berlin, Germany, Badeloft had expanded into numerous US locations, with their main showroom located in the San Francisco Bay Area. The factory produces Stone Resin bathtubs and wash basins. The Stone Resin is an engineered composite consisting of Dutch polyester resin, dry ground marble, and limestone filler blend. The products are manufactured with non-toxic materials that are 100% non-porous, none-leaching, lead free, and therefore unaffected by fluctuating moisture or humidity. 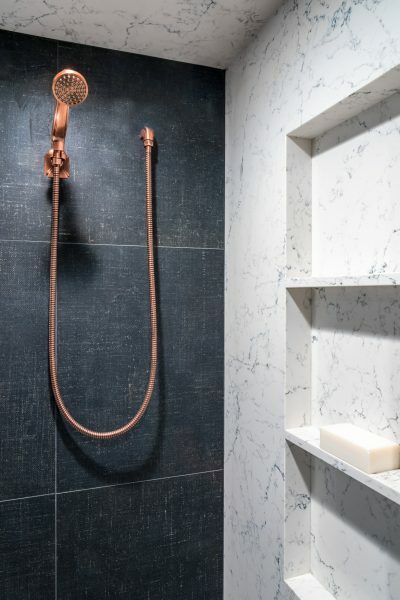 Perhaps more practical than a free-standing tub, a walk-in shower is a great part of your bathroom to upgrade in the remodel because it is a feature of the space that can make or break your bathroom. A cramped, drabby, or poorly-designed shower is a drag on both the form and function of your bathroom. 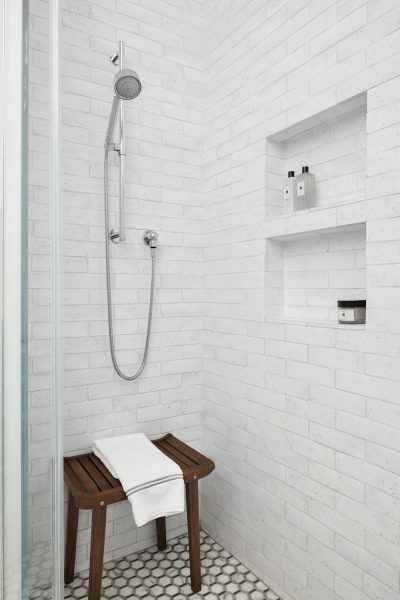 A well-designed walk-in shower incorporates thoughtful features, like built-in nooks for shampoo bottles and benches for sitting. Consider the quality and placement/height of your faucets. Also consider the backsplash and flooring; the tile, along with the hardware, will be what determine the entire aesthetic of your shower. We always recommend a glass shower door to make the space appear larger and more open (and to show off that beautiful walk-in shower). Design by Aimee Anderson Design. A walk-in shower is a great use of space if you have an awkwardly-shaped nook in your bathroom. Continue your tile into the walk-in shower for a sense of continuity. 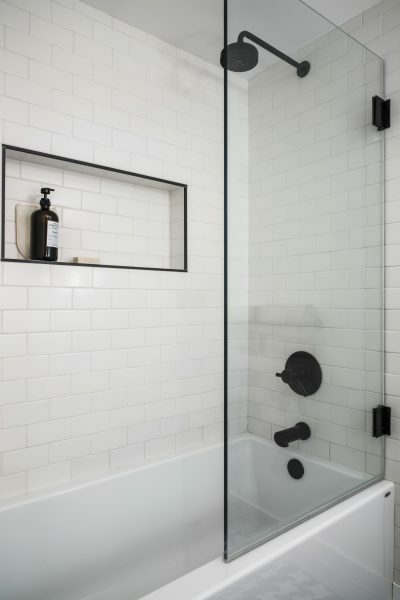 Install a glass shower door and level your shower with the rest of the bathroom to truly incorporate your walk-in shower and make it feel like a part of the room rather than some closed-off section of the space. The bathroom vanity is definitely a focal point in the room, and many people decide to upgrade their vanity when remodeling their bathroom. We love vanities that are uber functional with tons of storage, but also high-impact vanities that make a bold statement. 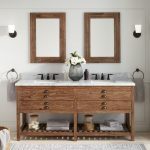 When choosing a bathroom vanity, consider its purpose. Is it in a shared bathroom that gets tons of use? Do you need lots of storage? Is it a powder room or guest bath that you can be more playful and creative with? Double vanities — once you have them, you’ll never want to go back. You can offset the visual weight of a double vanity by incorporating both opened and closed shelving. 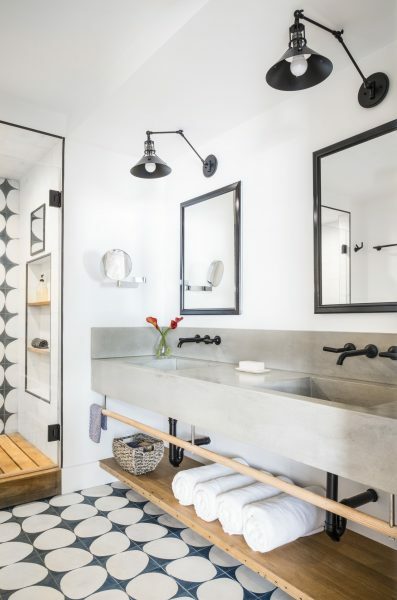 In this bathroom by Aimee Anderson Design, a wood and concrete floating vanity truly commands the space. 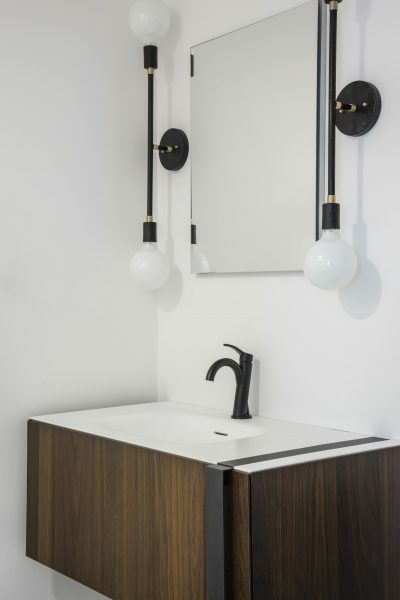 Every detail in this vanity comes together for a stunning impact — the matte black hardware, the exposed pipes, the wooden plank. 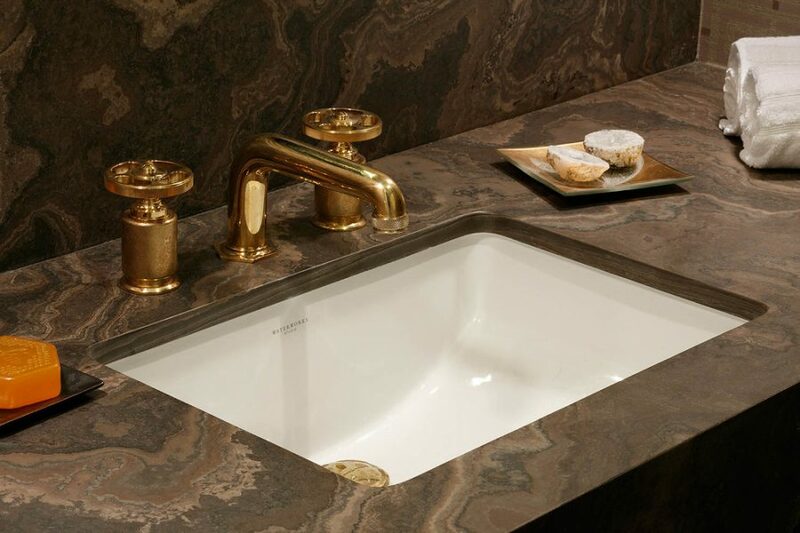 Your bathroom vanity is also the perfect opportunity to go bold and luxurious. We are a huge fan of floating vanities. 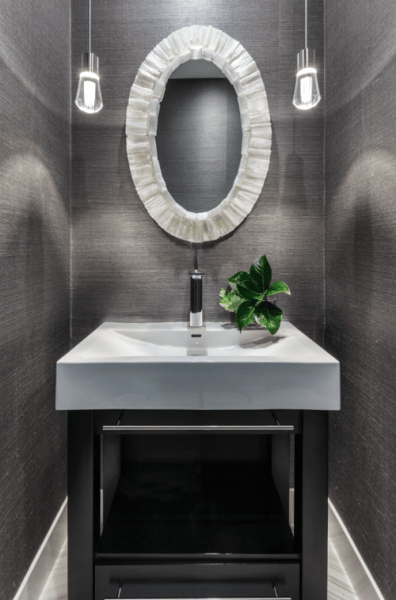 While a conventional vanity can look visually heavy, a floating bathroom vanity helps to break up and open up the space, making it appear larger. In addition, they add another sculptural design element to a space. Probably one of the less exciting pieces in your bathroom, your bathroom mirror nonetheless plays a huge role in the balance of the room. 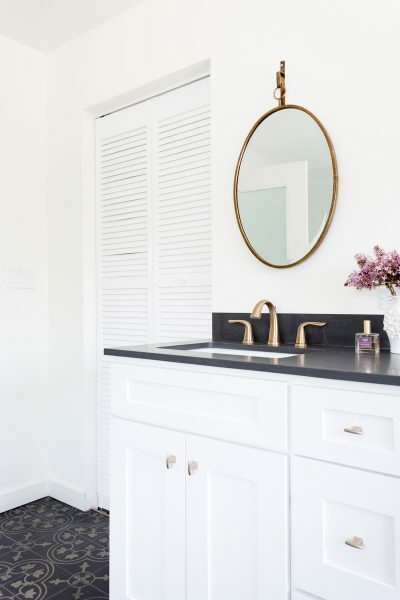 While many people opt for a classic, simple bathroom mirror, a basic mirror doesn’t mean boring or bland. Choose a carefully curated mirror in terms of silhouette, size, shape, scale, and color. Match your mirror frame with the rest of your hardware, like the brass and matte black mirrors below show. Lastly, consider the placement of your mirror so that everything looks balanced. Design by Michelle Dokey. Photo by Amy Bartlam. 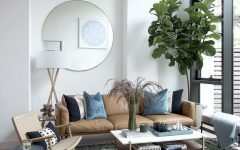 Or, go for a more decorative mirror to act as the focal point in the space, great for a small bathroom or in simple bathrooms with few pieces that the mirror would clash with. 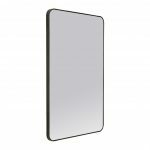 For a more in-depth guide on bathroom mirrors and how to choose, place, and hang them, click here. Of course, you can’t forget the floors when remodeling your bathroom. Your floors can really set the tone of the space, from light and airy to dark and cozy. 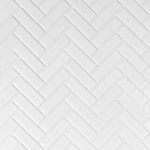 A herringbone tile is a fan-favorite and looks gorgeous in bathroom spaces. 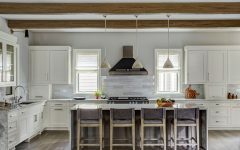 You might want to consider installing a floor that retains heat well, or even consider installing heated floors for those cold early mornings. 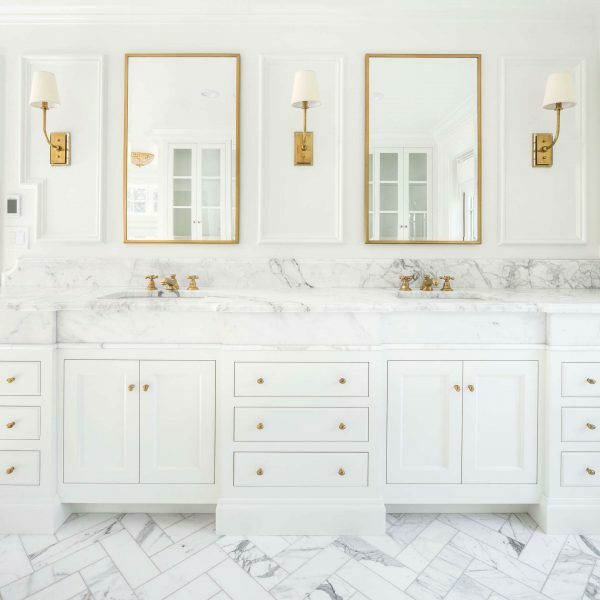 In this modern bathroom by The Fox Group, a marble herringbone floor runs throughout this all-white bathroom, making everything look seamless. The marble is repeated throughout the room, like in the marble countertops. The soft gray marbling adds dimension and visual interest throughout the room. 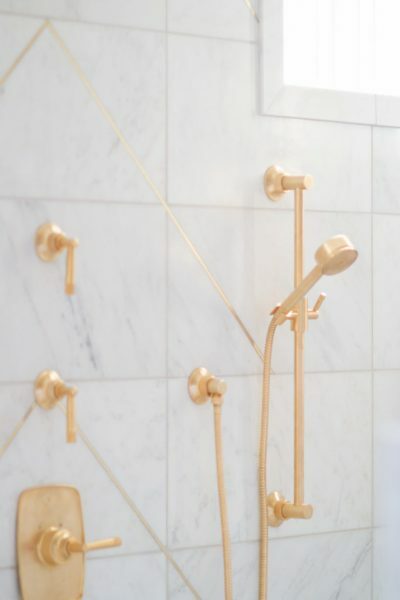 Lastly, you do not want to overlook the hardware in your bathroom. 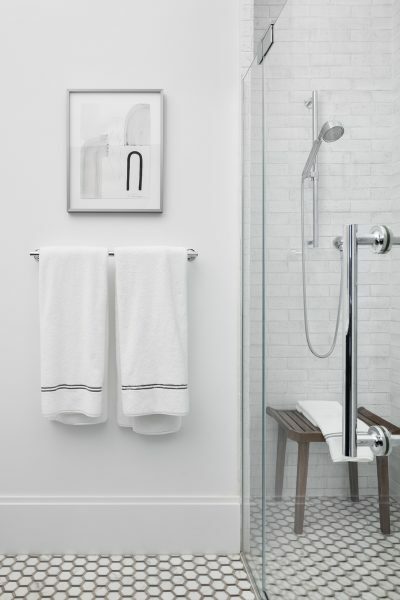 They have a subtle but striking impact on a bathroom and help to make a space look cohesive. From the sink faucets to the shower head and cabinet pulls, leave no stone unturned and be sure to pull everything together for a cohesive look. Consider the color, silhouette, and placement of your hardware. 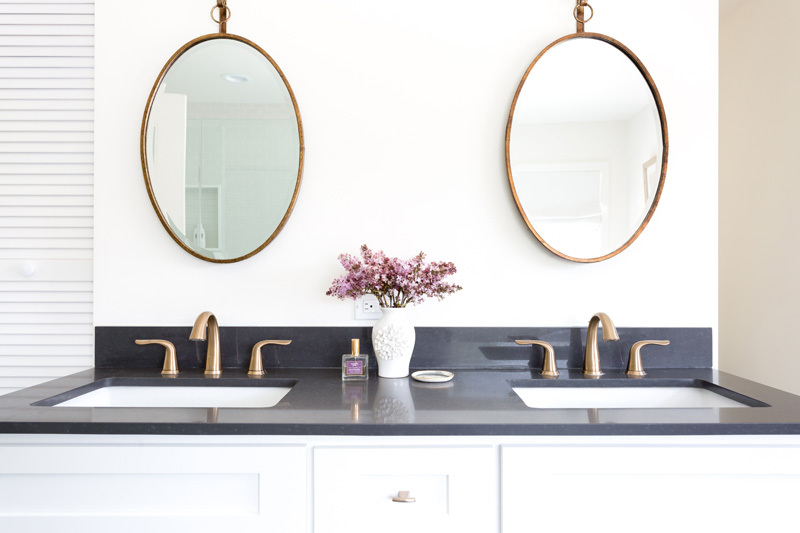 Our top two choices for bathroom hardware would have to be matte black hardware for a modern, sleek look or brass hardware for those pops of warmth. What did you think of these bathroom remodel ideas? Comment below!